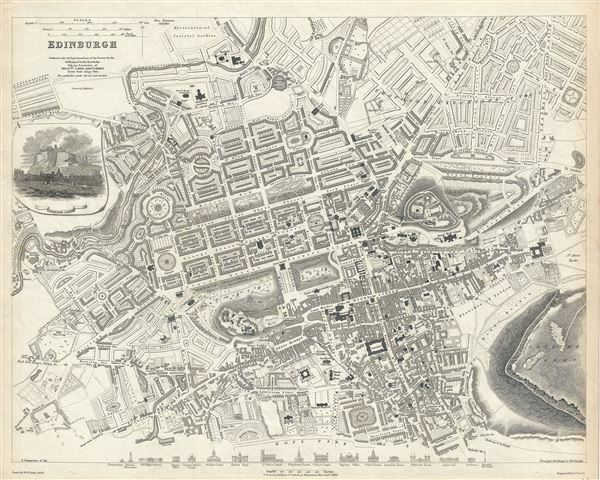 This is a beautiful 1834 map or plan of the city of Edinburgh, Scotland by the Society for the Diffusion of Useful Knowledge. Centered on Old Town, it covers the city of Edinburgh, known as the 'Athens of the North' in exceptional detail, noting individual streets, buildings, rivers, squares and parks. A beautiful illustration of Edinburgh Castle is included along the left border, below the title. The lower border depicts the many important monuments and buildings in profile. These include the Observatory, the Old High School, St. Giles's Church, St. John's Chapel, Assembly Rooms, Colton Jail, etc. In the 19th century, Edinburgh was the heart of the Scottish enlightenment. Celebrities from across the continent would be seen in the city streets, among them famous Scots such as David Hume, Walter Scott, Robert Adam, David Wilkie, Robert Burns, James Hutton and Adam Smith. Edinburgh became a major cultural center, earning it the nickname Athens of the North because of the Greco-Roman style of the New Town's architecture, as well as the rise of the Scottish intellectual elite who were increasingly leading both Scottish and European intellectual thought. During this time, Edinburgh, like most of Scotland, benefited enormously from the Industrial Revolution. This map is based on a larger map by Messrs. Laing and Forbes and is printed by J. Henshall. The map is engraved by E. Turrell and Published by Baldwin and Cradock for the Society for the Diffusion of Useful Knowledge in 1840. Although the Society closed its doors in 1848, Subsequent reissues of the S.D.U.K. atlas were printed well into the 1870s by Chapman and Hall, who acquired the original plates.